Dutch bearing specialist PM Bearings required a machining centre that could be nano positioned to produce tiny ultra-precise linear bearings. Use FANUC Robodrill to produce the tiny linear bearings for high precision medical, military and semiconductor applications. These offer incredible repeatable accuracy, plus the fastest milling, drilling, tapping and tool change times on the market. PM Bearings produces all its bearings using Robodrill machining centres and has never had to interrupt production due to a malfunction or defect. One machine is 19 years old and is still working perfectly. Needless to say, accuracy is second to none whatever the material being machined. It changes over incredibly quickly from drill to tap to mill. We always have high speed spindles installed. PM-Bearings in the Dutch Dedemsvaart specializes in ultra-precise linear guides, nano-positioning systems and complete machines, in which a micrometer-precise positioning is an absolute requirement.. The metal-working company very conscientiously chose Robodrill for producing its smallest linear bearings for medical, military and semiconductor applications. PM-Bearings is part of the PM Group. With its Dutch offices in Dedemsvaart, Almere and Hengelo, the Group designs, develops and manufactures mechatronic systems, precision structures in sheet metal, advanced coatings and high quality solutions for the aviation and military sector. Companies all over the world call on the expertise of this Group. Almost 90 percent of the production is destined for export within Europe, to North America and Asia. 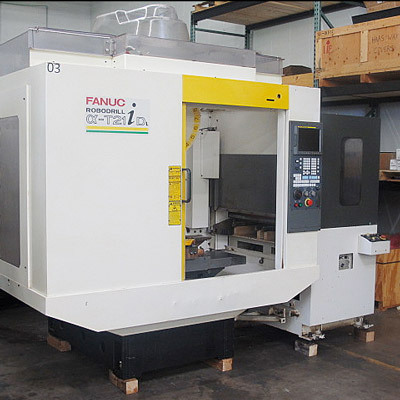 For over 20 years, FANUC Robodrills have been assuring the production of the smallest guides in small to medium sized series of 10 to 500 pieces. The production takes place in the material that is most suited for your application, such as stainless steel, aluminium, carbon and even ceramic. You will find the bearings in, among others, semi-conductors and lithography machines for producing electronic chips, pick & place systems, microscopes and all kinds of high technology medical equipment. Production Manager Pim Lüth: "We chose FANUC at that time because the Robodrills excelled in speed. And they still do that even now. Drill holes, tap threads and bevel bearings and mill to length: no other machine mills, drills and taps so fast. It changes over incredibly quickly from drill to tap to mill. We always have high speed spindles installed. In our models, we get 20,000 revolutions per minute. "The precision and therefore the quality of our guides also increased significantly. Precision is vitally important for us. Our profiles deviate by maximum 2 micrometers per meter. The end product must also be finished precise to the micrometer. The maximum deviation of our bearings is 4 micrometers. PM-Bearings currently uses seven Robodrills: one a-T10B, two a-T14iAL’s, one a–T14iBL, one a-T21iDL and two six years old a–T21iEL’s. The company equipped four out of these with a fourth axis. Pim Lüth: "We had to machine our guides along all sides. The Robodrills with a fourth shaft and the DDR turntable do that in one clamping and do it faster. We use them to produce the medium sized series. On the machines with three axes, an operator must still change the piece from the side a few times." "The robustness of the machine is also a great plus. We have never yet had to interrupt our production on any of our Robodrills due to any malfunction or defect. The older Robodrill that we have, the a-T10B, is already 19 years old. It is still working perfectly." PM Bearings has plans to fully automate the production of its high precision linear bearings within a few years. "Our goal is fully automated production. A first step in this is to fit Robodrills with the automatically opening doors and FANUIC robots to load and unload them.